It is arguable that Facebook has changed our everyday lives, it allows us to share news with all our friends at once and we can in turn see what everyone else is up to, but just how much sharing is too much? Who do you share all your updates with? Would you tell your boss that you were so drunk that you were pushed home in a trolley in the office on a Monday? So why would you allow them to see it on Facebook including pictures? According to a survey by The Ponemon Institute 76% of managers look up their interviewees on social networking sites before hiring them. This is especially common with college and university graduate, as the most social networking active age group, Sue Murphy from the US National Human Resources Association sheds light on this “For people new to a field, companies just don’t have a lot to look back on. They can’t call up your former boss. They look you up on Facebook.” The survey shows that Health care professionals and those working in financial and legal services are the highest group of employers to search for their prospective employees, this is thought to be due to the fact that they are representing their company and any online activity reflects on the company if they are known to be affiliated with them. Because of often-unclear privacy settings on sites such as Facebook and Twitter, prospective employees are largely unaware that this happens. They therefore think it is wrong that employers look them up on their own “personal space”; these are the people that don’t understand how big and open anything you put in the public domain is. It is important to update your privacy settings on Facebook regularly and if you’re prone to ranting on Twitter, private your tweets. In more recent years Twitter has been a breeding ground for offensive tweets which have led to disciplinary action, with those in employment sending tweets from their professional accounts and members of marketing and PR teams tweeting personal views from the main company account. In a lot of cases this has meant severe apologies and investigations as well as having a negative affect on the company. Below is a tweet sent by Gloria Huang, an employee of The American Red Cross on the wrong account. There were no grounds for dismissal prior to this tweet as it was recognised as simply a mistake. 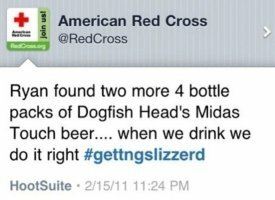 The beer company Dogfish Head retweeted it and encouraged their followers to donate to the Red Cross. The next hurdle if you are employed is whether or not you add your work colleagues on social media sites, it is generally regarded as a courtesy that if you are friends with someone you should add/ accept their friend requests on Facebook, but this needn’t be the case in employment. The important thing to remember is that if you do add your colleagues or even your boss that this is no longer just a social space, you could potentially be judged on your behaviour on nights out, what you wear and your attitudes. 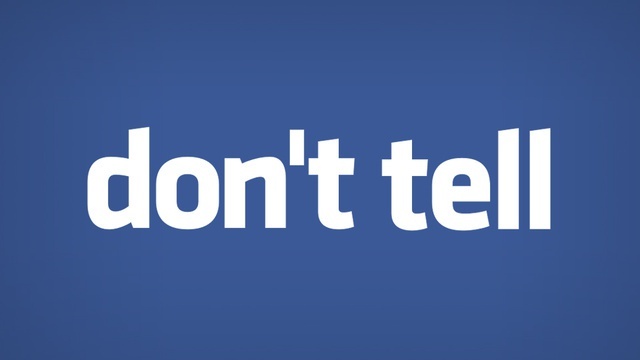 Facebook however allows you to hide each individual post and photo or group of photos from certain people, meaning you can still maintain your social space and it won impact negatively on your employment. In order to prohibit employees from posting opinions about aspects and the company, their colleagues and its clients, many bigger companies now have a social media policy, it is down to the employee to read and review their behaviour in accordance to this. The one solution to avoid termination or rejection of employment is simple; if its not something you would be happy with your grandma knowing- don’t post it. Personally, whilst it’s all well and good to not put certain things up on social media websites to avoid rejection, I think it’s a step too far for companies to research potential employees on Facebook to find out things about them. There needs to be a clear divide between work life and social life, otherwise the air of professionalism completely disappears. I started my new job today and one of the first things they warned us about was “Be careful what you put on Facebook!”-before they’d even given me my computer access! I think that if you post something out there in the public domain on the internet, employers are perfectly within their rights to seek it out to check if you would be a suitable employee. People definitely need to become more savvy and take responsibility for what they make public, as it is actually pretty easy to make everything on your social network private, once you get your head round each sites privacy settings. However, I think there is a line when it comes to social network privacy which some employers have crossed. For example it has been reported that several American companies have demanded that applicants hand over their Facebook password upon employment. This is totally wrong. If you’ve made a drunken photo public then you have to face the consequences, but if you’ve made the effort to make that private, then measures need to be put in place to make sure that privacy is protected and respected. I have a semi-professional Twitter, a professional Tumblr and a personal Facebook. If Facebook wasn’t so good for keeping in touch with friends and local writing contacts I wouldn’t even have that. Also a Pinterest but I tend to be fairly inoffensive and have a hidden board for anything controversial. I never think that employers would check facebook or twitter which I suppose is really naive of me. I should probably really start watching what I put and say online! I think there definitely is a fine line between being ‘yourself’ on social media and just being inappropriate. You don’t want to sound like a brainwashed industry robot (or I don’t at least), but there are definitely some things you shouldn’t share/tweet/update etc. I’ve had a couple of strangers come up to me before at fashion industry events and say they know who I am from twitter etc – that kind of thing really makes you think twice about what you say!! I don’t have a problem with potential employers checking out my social media presence. I’m a PR professional, if I can’t be trusted to look after my own reputation then why would anyone employ me to manage an organisation’s? I’ve heard it can go the other way too – if you don’t have a lot of social interaction on facebook and don’t have photos of nights out/ social gatherings etc, companies can assume you are unsociable or not a ‘people person’ and not employ you because they don’t want any nasty introverts on their team or whatever. I don’t really see why employers prefer extroverted people to introverted people, but it seems to be the case. I guess people think they are easier to get along with. This is so true! I work in a school, I have a lot of my colleagues on Facebook however I don’t post much on there myself and rarely put pictures up anymore. I make sure that I can see any tagged pictures before they go onto my news feed. My settings are on a high security settings, this is mainly due to parents finding me etc. My twitter is also on a ‘private’ mode. The only thing that worries me is my Tumblr blog but I find that they are quite well hidden, and I mainly moan about my illness, not about my work/employers. I would have one with a password but I would like other people on the community to find me. The fact that we live with social media as a constant means we have to adapt to it, personally as well as professionally! It is terriying, though, isn’t it?! I check my security settings at every chance I get but it stills makes me nervous! Wow. I had no idea that this whole thing was going on! Definitely going to think twice about what I post now, I might even get a professional twitter account, just incase I go looking for jobs now! I don’t agree with the whole “search for potential employees on facebook” movement though, as although my content is all private people can still see my profile picture! ← Social networking – Who What When?